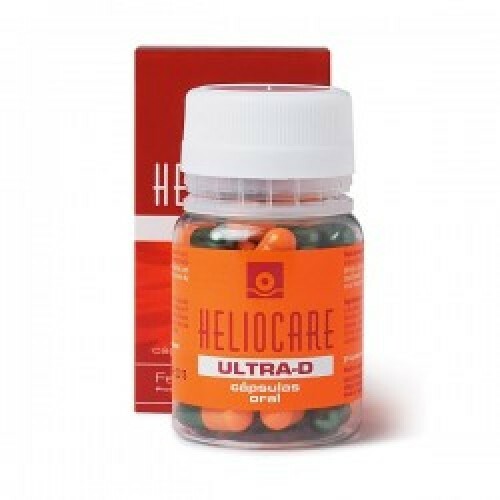 Help to strengthen your skin’s natural defences against sun damage, as well as boosting your body’s vitamin D levels with these supplement capsules from Heliocare. If your skin is sensitive to sun exposure or is prone to prickly heat, then Heliocare Ultra D Oral Supplement Capsules are for you. Taking a capsule every morning, or throughout the day during times of high sun exposure, boosts your body’s natural defences against sun damage from within. Each capsule provides antioxidant protection in the form of vitamins C & E and the Fernblock complex, while the underlying skin architecture is enhanced, protecting cellular DNA and immunological functions. If you are concerned about low levels of vitamin D, which can lead to many different health complaints, each of these capsules contains a dose of the essential vitamin to increase your levels. 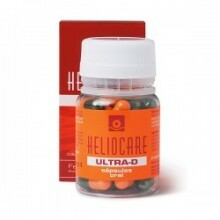 Heliocare Ultra D Oral Supplement Capsules should not be used a replacement for a topical sun protection. Take one capsule each morning. Repeat the dose every 4-6 hours in times of high sun exposure.